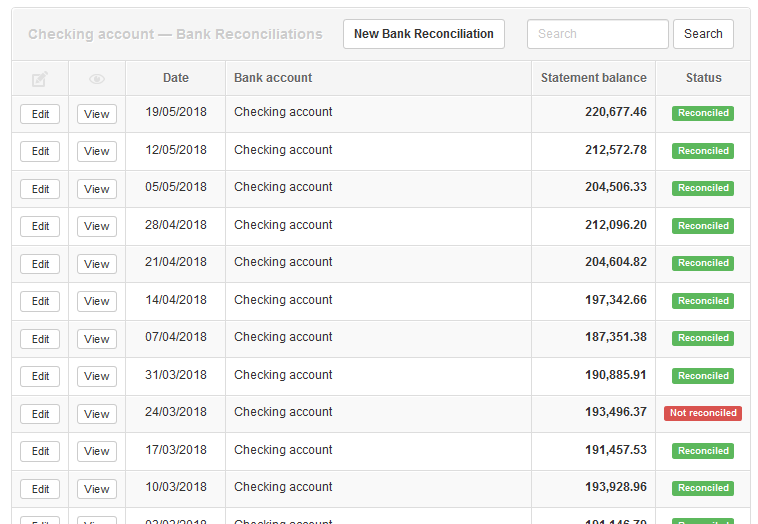 The latest version (18.5.26) introduces some subtle changes to give more clarity when there is a discrepancy in bank reconciliation and makes it easier to troubleshoot it. This is how your list of bank reconciliations looked like when your bank account was fully reconciled. However let’s say you have accidentally deleted one transaction a few months back. Due to rolling effect, all your bank reconciliations after the date of deleted transaction would become “not reconciled”. The image above looks like a lot of work has been lost and will have to be redone. Little mistakes happen all the time and Manager shouldn’t exaggerate them. So the latest version will present better picture of what is really happening. Now you can see the mistake has occurred only in one bank reconciliation period and should encourage you to just fix it. This visual presentation is also useful if you are reconciling particularly long period. Bank reconciliation workflow will encourage you to split your workload into smaller periods and as you are working through them, they will be going “green” one by one. This will give you better idea of the progress you are making towards fully reconciling your bank account(s). When you upgrade, you will also notice you have far more “bank reconciliations” than you had before. This is because every statement balance you have entered into Manager previously is now shown as “bank reconciliation” for the date statement balance was entered. Previously it was impossible to see this list. Interesting. Looking forward to testing this. let’s say you have accidentally deleted one transaction a few months back. Bank reconciliation workflow will encourage you to split your workload into smaller periods and as you are working through them, they will be going “green” one by one. This will give you better idea of the progress you are making towards fully reconciling your bank account(s). this would still be a lot of work for the user to correct every reconciliation i believe. if the deleted transaction is reentered with no changes, Manager still have the correct data entered by the user in the reconciliation, so is it not possible for Manager to just correct the reconciliation automatically for the period and the periods forth? if the deleted transaction is reentered with no changes , Manager still have the correct data entered by the user in the reconciliation, so is it not possible for Manager to just correct the reconciliation automatically for the period and the periods forth? If you re-enter deleted transaction, your bank account will become reconciled automatically. So what you are describing is already working that way. thank you for clarifying it. I haven’t tested this yet but that’s an awesome development. I have done this several times in the past and although it’s relatively simply to find going back to the first reconciliation that failed, it’s nice that we can move ahead without 'worrying about it now", so to speak. I love seeing the statement balance on the new dialog!